I’m the Co-founder of a recently launched email-first startup called Planleaf. Planleaf is task management software that works completely over email with nothing to download, install or sign-up for. There is a thriving community start-ups doing incredible things with email. It’s quite inspiring. So what is an email startup? Well I guess an email startup is a company that makes technology that is deeply tied to email in some form or fashion. 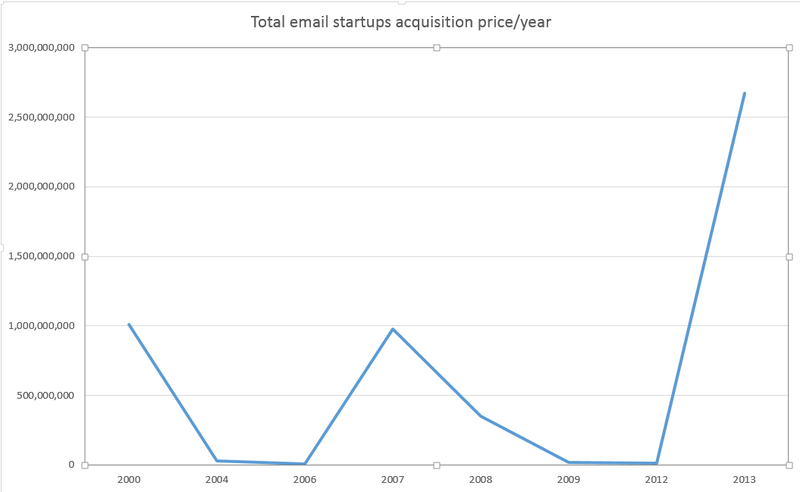 With this definition in mind I decided to compile a list of email startups that have been acquired since the year 2000. Below is a graph of total acquisition price by year. You’ll notice that during 2000 total acquisition price was about ~$1B. In 2007 we again almost hit the $1b mark (thanks to Google’s acquisition of Postini). And most importantly in 2013 we hit a total acquisition price of ~ $2.7B. Note: Undisclosed/unknown acquisition prices account for the dips in the graph. There were actually acquisitions in those time periods, but the acquisition prices are unknown. I’ve listed out all acquisition data with their price (some of which are unconfirmed or unknown), the acquirer and year of acquisition in parenthesis.